Tony was really helpful advising us on what to use. We bought the mattress cover, bed bug dust, steamer and tape, and after a few days in quarantine in our backyard, all our belongings were steamed, washed or dusted. 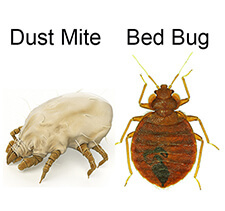 It’s now been 6 months and we haven’t seen any bed bugs (we had an infestation on our travels so expected we had brought them home, if not actually caused the infestation ourselves by catching them on the airplane / backpacker hostel on the way over). The dust was a really effective way of preventing further outbreak, and the mattress encasement protects our expensive mattress from going the way of the one we slept on overseas (into the bin! ).